Linux Music: LMMS, Linux’s Own “Fruity Loops”? Sure, we’ve heard lots of promises about Linux audio before, but until Linux gets a killer app for actual music making, what’s the point? 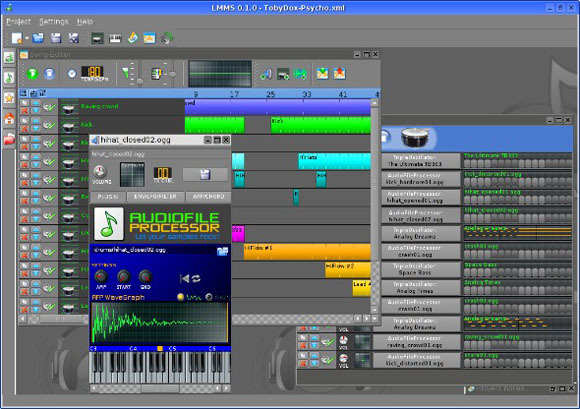 Enter LMMS, the Linux MultiMedia Studio. LMMS is a loop-friendly, all-in-one tracker / sequencer / groove-maker with built-in instruments, a la FL Studio (aka Fruity Loops) on Windows. In contrast to other Linux audio outings this far, the interface isn’t daunting at all. The instrument lineup looks a little limited so far, but it’s still under development (and it sends MIDI, so you could round up some garage sale synths). Serious competitor for the likes of FL Studio and Reason? Doesn’t look like. A way to make music simply without spending a lot of cash? Very possibly, especially with a free OS and the ability to build basic Linux hardware systems for a few hundred dollars. And in this age of tech haves and have-nots, that’s good news. Anyone out there using this?